SWC Poker is the reincarnated version of the most popular and biggest Bitcoin powered poker site – Seals with Clubs. The site shut down on February 20, 2015 for a variety of reasons. Fortunately, all funds were safe and secure and all players were able to cash out their bitcoins. With that being said, SWC Poker is a true successor to the old format – bringing enough improvements while still managing to continue the tradition of the original. We are talking 100% commitment to bringing the best Bitcoin Poker experience, meaning completely anonymous (and instant) deposits/withdrawals, a good variety of games, excellent player support, lots of promotions and more. The new look of SWC Poker isn’t just on the outside – the site now boasts a new downloadable client for PC users, named Bitcoin Poker 2.0. While it does remind us of the old client, there are some improvements worth noting. 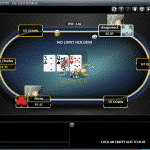 For instance, the new client boasts a new slash of features and games like OFC pineapple, badacey, badaeucey, dealer’s choice, 12 game and more. Each can be played in Cash, SnG or the MTT format. If you are not familiar with either of them, you can read up on each and every game (and feature) on SwC Poker’s web site. 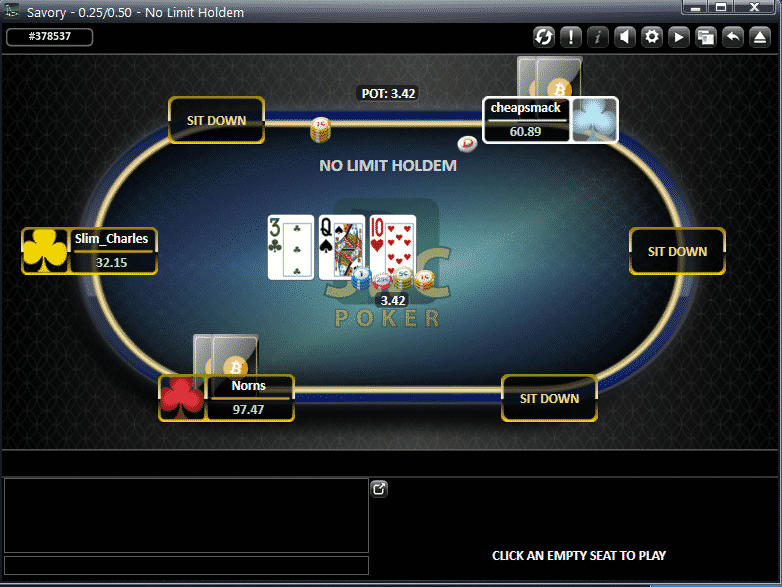 As for the looks, well it is boasting the same standardise visuals most Bitcoin poker sites seem to favour these days. Note that this isn’t a bad thing – the software runs smooth, and the design is made with player perception in line. With that being said, there isn’t anything specific about it that stands out. In order to be able to play at SwC Poker you will need to download their PC client. This might seem unusual in emerging instant-play industry (especially where Bitcoins are involved) however, this is done with something else in mind. Players who already had an account with the previous site can request their old Krill back (more about Krill later in the text). The process to recover the account (or accounts if there were multiple to one email) is simple and requires following several steps explained on the download client page. As a major player in the online Bitcoin market, SwC Poker doesn’t skim on their promotion packages for new and regular players alike. In order to take full advantage of all the bonus offers they have, it is best to read up on each and every one (info is available on the official website). This is the regularly scheduled weekly tournament which is traditionally held each Sunday. Players can participate by making a small buy in (0.25 BTC which is equal to 250 chips). SwC Poker guarantees a prize pool that is equal to 10 000 chips or 10 BTC. Players are advised to get in the lobby in time in order not to miss out on the buy ins for the tournament. 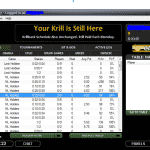 Similar to a casino’s comp point program (or loyalty program) Krill is SwC Poker’s way of rewarding regularly visiting poker players. 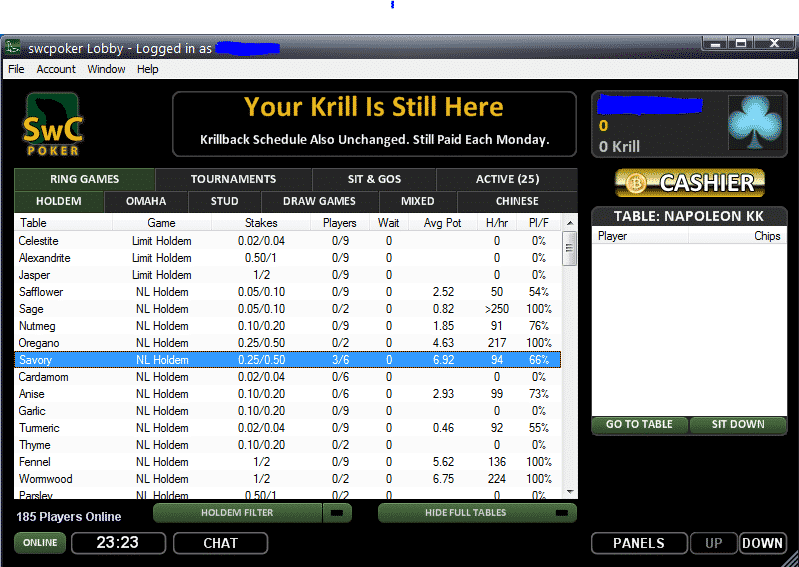 It is a point based system which grants players a number of Krill points every time they are dealt in to a raked hand. The system incorporates several mathematical operations depending on the situation the player is in so the amount of Krill is given appropriately. This amount varies from the type of game and system is being played (MTT, SnG, etc). Krill is essential for what is called a Krill Wave. This in essence is the table where you can calculate the rakeback you earn with each level earned. The first level or Wave starts off with 500 krill – also called a Floundering Seal. You only need a valid Bitcoin address and an email to be able to make deposits / withdrawals at SwC Poker. Anonymity is guaranteed and the transfer is both fast and secure. The deposits only require one confirmation before being processed. The player Bitcoins are stashed in several wallets for better safe-keeping. If you have problem claiming a bonus or you need assistance recovering your old account, simply send an email to support@swcpoker.eu and they will respond within a 24 hour period. The lack of online chat and a direct call line can be a bit wanting, but the customer service team makes it up with timely responses and professionalism. After a turbulent period SwC Poker brings its A game with a slew of excellent new / old features for all Bitcoin Poker fans out there. What especially stands out is the bonus offer – it is hard to find some many great deals for new and regular players. Not to forget the improved functionality of the game client and the increased emphasis on fast and anonymous transfers.